The Samsung Galaxy S5 is Here! Samsung’s latest addition to their flagship Galaxy S range, the new Galaxy S5, is more of an evolution than a revolution. Samsung have chosen improvement and refinement over flashy features or ground breaking innovation. 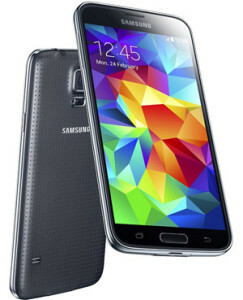 Looking at the front of the S5, Samsung haven’t strayed too far from the design of the S4. The back, however, sports a fingerprint repelling, matte finish cover with tiny, indented dimples speckled all over. Samsung have made improvements to the things that make the S5 tick, resulting in a smoother, snappier experience. The features that will come in most practical, however, are the new waterproof & dust proof characteristics Samsung have added to the S5.